I currently use the thirdd edition of Napoleon's Battles edited by Lost Batallion Games. However I have made several modifications to the Rules. Some are related with the higher size of the 20mm figures I use (respecting from the 15mm figures used by the rules designers), but other have been designed to cover some situations not contemplated in the design of a brigade-level rule-set such as NB. I use 20 mm figures (or 1/72, H0/OO...) SO the bases must be greater than the given in the rule-set, designed for 15mm figures. - Close order three-ranks Infantry bases are 2.5x2.5 cm squares (1"x1") to accommodate 4 figures whereas two-raks infatry are mounted in a 3.8x2.5 cm (1.5"x1"). The bases for Open order Infantry are 8.0x4.0 cm (3.2"x1.6") also for 4 figures. 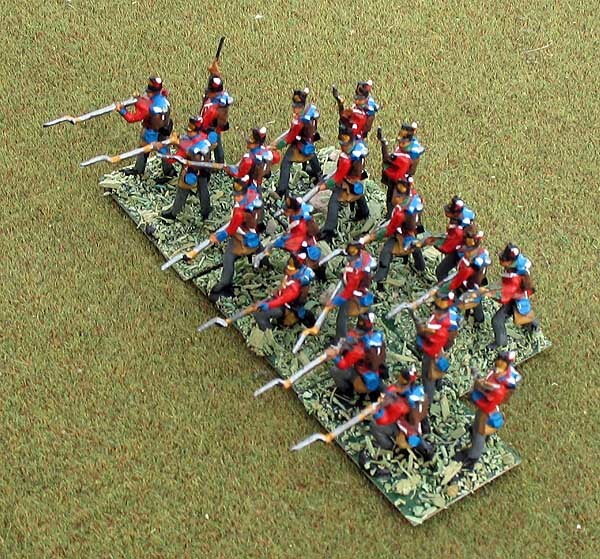 - Cavalry bases are 4.0x3.5 cm (1.6"x1.4") for two figures. 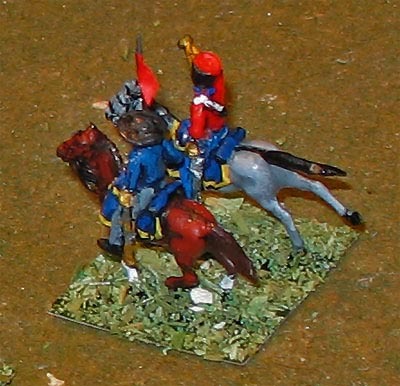 Cossacks and other irregular cavalry use 4.0x7.0 cm (1.6"x2.8") and three figures. 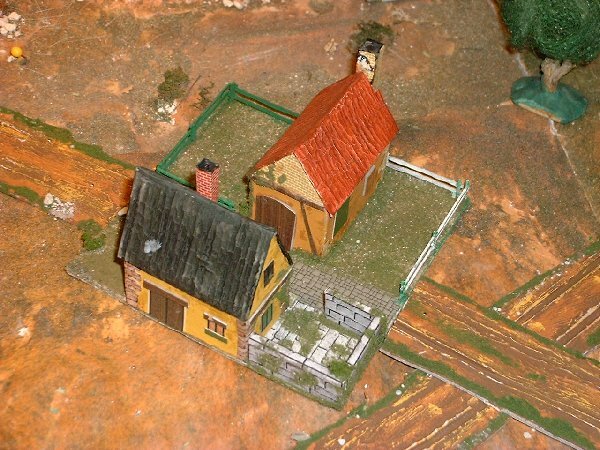 - Artillery bases are 3.5x4.0 cm (1.4"x1.6") for two artillerymen and gun. - C-i-C, Corps and Wing Commander bases are 4.0x4.5 cm (1.6"x1.8") and have a mounted General officer and two additional figures. The slightly greater front of the close order three-ranks Infantry takes into account the full deployment (in line or 'en bataille') of all the 480 men so the distortion is almost null. The reasoning is: 480 men/3 = 160 men/rank. A infantry base has a frontage of 1" = 100 yd, SO each real infantryman will occupy 100 yd/160 men = 0.625 yd/man = 1.875 ft/man = 57.2 cm/man. This value is very close to the found in the Infantry manuals of all nations in Napoleonic era. For two-ranks infantry and making similar calculations: 480 men/2 = 240 men/rank, so the frontage of these infantry bases must be the 240/160 = 1.5 times the frontage of a three-ranks base, i.e. 1.5"
The use of two-figures bases gives a greater flexibility allowing to depict different combat or march formations. The frontage of a real cavalryman was around 1.30 yd. Each cavalry base has two figures @ 120 men/figure = 240 men, but Napoleonic cavalry habitually formed in two ranks, so the frontage of a cavalry base corresponds to 120 real cavalrymen, which must occupy 120 * 1.30 yd = 156 yd of terrain, i.e. 1.6" in the game table (around 4 cm). Cavalry losses are as per the rules but two cavalry figures are removed for each three NB losses. No rule must be changed for infantry and/or artillery. In the case of cavalry, is necessary to multiply the number of figures for 3/2 in some cases (for example to determine outnumbering in combat) as well as to remove 2 cavalry figures for each 3 casualties. There is not a minimum number of men for an unit (infantry or cavalry). In that way, situations in which under-strength units were present in the battlefield can be covered. For example, semi-depleted brigades because of previous casualties or units with specifical roles as were the Prusian cavalry regiments assigned as close supports to post-1812 Prussian infantry brigades. B.U.A. 's are 13x13 (5"x5") squares (See BUA's Section) with one fixed and one removable building (with an underlying ruined building). There is sufficient space to deploy a seven-bases Infantry brigade, so the area can be actually occupied. An attached general is not required but then a '-3' additional modifier must be used. The NB2 optional rule is always used. An attached general is not required but the dispersal attempt requires a previous rout move. NB only depicts on the table the reserve and horse artillery batteries. This leads to some historical inconveniences. For example, some armies (specially the British) used the foot batteries as close supporters to infantry brigades and thus, in NB, the British armies are always short of artillery when compared with French ones. 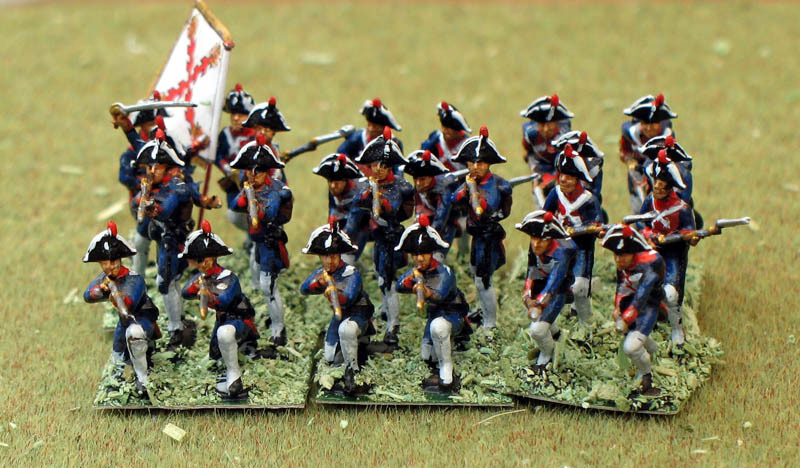 In other occasions, the small size of the historical engagement simulated (for example in the Peninsular War) does not justify the presence of artillery units and... I like the guns! Therefore I use divisional foot batteries in some scenarios. These batteries have a smaller mobility, never can evade and their Fire Factor is lowered by using a '-1' modifier. 3) Carry out the infantry fire as usual without any modifier. The resulting losses are not marked on the target unit, but are only used to cause disorder (Recommended). Almost every type of unit is covered in the rules. However some of them are missing, usually because the designers do not considerated it as deserving an inidividual category: for example the French Dragoons transferred from Spain to Germany in 1813 and used there as heavy cavalry. These units (and others such as the divisional foot artillery described above) can be easily added by modifying a similar unit type.. The NB designers are very strict about the lack of negative modifiers when an unit is attacked in flank or rearguard. Their rational is that NB being a grand-tactical game, the abstracted brigaded commanders will care about the actual location of their sub-units, into the brigade area. However, I think (along many more NB players) that the moral effect of an attack in flank or rearguard must be taken in account. Therefore, an unit attacked in flank will suffer a '-2' additional modifier in the combat resolution. If the unit is attacked in the rearguard, the modifier will be -'3'. In some small armies, like the fighting in the Peninsular War, could be interesting to simulate the semi-independent tactical role played by some Brigadier Generals (for example the British Cavalry and Portuguese independent Brigade Generals) by showing they in the tabletop. These Brigade generals must remain continuously attached to their brigades, so their command radius is not printed in the labels (nor counted in the points value of the Army). The labels can be glued on an individual General figure or on the command base of the affected unit, as preferred. This tactical formation, as dear to French generals, deserve its inclusions in the allowed infantry formations. Brigades in such formation are basically in column, but one or more bases of the rear rank are placed in the front rank. The Movement allowance is the columnar substracting 1" (or 2") for each base added to front. The Combat Factor is the same as in 'Column' with a `+1' modifier. The unit must be previously rallied and within the command radius of its Corps Commander or must have attached an officer. It must be at a distance of the enemy greater than 6". The unit losses must be greater than 4 and never will be fully recuperated. The modified Response number of the unit is entered in the column corresponding to the number of losses to be recovered, and the red number gives the Recovered losses.